One of my favorite food memories in Italy was on New Year’s Eve a few years back. I had just spent a month working in London, as part of a much needed breather from Florence during a time when I was (almost) ready to throw in the towel and give up on Italy. That month taught me a lot of things about why (for me) Italy is pretty great and that it has (quite possibly) one of the best food cultures on the planet. And not because of the British-food-is-rubbish cliche, but because it was quite frustrating that drinking was rampant but food was rarely considered important alongside. Finding a snack with a beer other than either fancy expensive gastropub food or barely edible (still expensive) pub food was a challenge. I was met with some laughs when I asked “why isn’t there food served with happy hour?” “where is the food with the endless amount of hooch at this party”. Some friends chuckled back “eating is cheating.” This doesn’t represent every Brit, of course! Don’t get me wrong, who doesn’t like a nice buzz from knocking back a few beers, glasses of wine or cocktails. But Italy has taught me that alcohol is treated as a pleasure and is encouraged with food, or at least after having had a satisfying meal. Not to say that all Italians are prudent and no one gets drunk- it’s just a different type of drinking culture where the objective of drinking is not for drunken sake. I also met many Italians in London who really missed Italy deep down, and lit up anytime food back home was mentioned. While I understand the reasons for why people leave, it truly saddens me, especially when you consider how rich the culture and rituals around food are, something I consider so cornerstone to the (wonderful) human experience. So I came back shortly after Christmas just in time for New Year’s Eve, totally refreshed and relieved to be back. I don’t want to discount the great and wonderful things England or the rest of the world can offer, but we tend to forget the bigger picture and see greener grass on the other side. One of those great things I appreciate about Italian culture are food rituals, such as the tradition of eating Cotechino and Lenticchie (lentils) at the stroke of midnight. I recall being at a NYE party in Florence that year where drinks were flowing, people were dancing and at the corner of the dance floor was a table of food covered up. I had no idea what the hell it was but I was instructed not to touch it or take a peek. Once the minute hit, kisses had gone around we then sat down to a long table and were served lentils and this sausage stuff cotechino. This struck me- I thought what a beautiful way to ring in the new year. All sat together, breaking bread and eating something hearty which probably helped to balance out our blood alcohol levels. It was probably the first NYE where I didn’t get sloshed. I’ve kept it up every year since by eating lentils and cotechino for dinner if abroad since most dance clubs or house parties are not exactly seating everyone to food at midnight. What is cotechino and why is it served with lentils…and why is this a New Year’s Eve food tradition in Italy?! Cotechino, also Zampone is a type of cooked down pork bits (the good stuff) and rind, spiced with what seems like Christmas mulled wine (nutmeg, cinnamon, wine etc) and then formed in a tube and sliced. It has a soft, fatty texture savory spiced. There are different variations on cotechino depending on the region it comes from but Modena is most commonly associated with its production/provenance. If you get Zampone, it is pretty much the same meat but stuffed in a pig’s trotter. It is served with lentils because they are thought to resemble “coins” thus bringing prosperous luck to the New Year. While this is of course one of the many Italian superstitions, I do love the tradition around it. Want to bring a little Italian luck to your New Year? Make Cotechino and Lentils at home or make sure to snag a plate in Italy should you be celebrating in the bel paese. Where can you buy cotechino? Try calling your local Italian specialty store, wholesaler or deli. If you don’t have one nearby, try Whole Foods Market. Try to support the little guys first before heading to mega giant whole foods. Cook the cotechino on a low boil for about an hour and half. Mario suggests punctured the outer layer with pins. In the meantime, prepare the lentils. Boil the lentils in 1.5 liters of salted water with garlic and sage for about 20 minutes, taste along the way to make sure they aren’t too firm or mushy. They should hold their shape. Once cooked, remove excess water by draining, transfer to a bowl and season with salt and pepper. Dose cooked lentils on a platter. Once the Cotechino is ready, drain, slice and layer on top lentils. Serve! Drink with a light Sangiovese-based red or a Barbera from Piedmont. Abroad? Any tips on where to find Cotechino in your area? Leave a comment to help other readers get lucky this New Year’s Eve! Like that post? 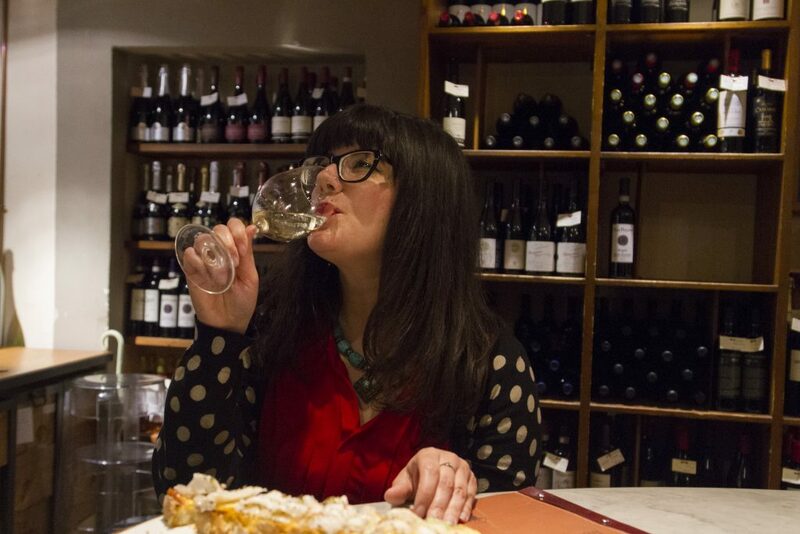 Subscribe for future posts related to all things Italy, food and drink! Follow tips on Facebook, Instagram and Twitter.